Life on the road can be lonely at times, but new research has revealed one way in which van drivers are combating the solitude: by bringing along a canine companion. On any given day, the average professional driver spends over 17 hours completely alone, with over a third (35 per cent) spending at least 20 hours in solitude. Mental health and driver wellbeing has become more of a focus than ever before, so drivers are turning to ‘man’s best friend’ to raise their spirits, with one in five agreeing that their dogs have had a direct positive impact on their mental health. Out of the 2,000 van drivers and owners surveyed by Mercedes-Benz, almost half of them (957) take their dogs on the road (47.85 per cent). With 451,000 people identifying van-driving as their main occupation, this means there could be over 200,000 dogs on the road in commercial vans on UK roads at any one time. Why are van drivers bringing their dog? 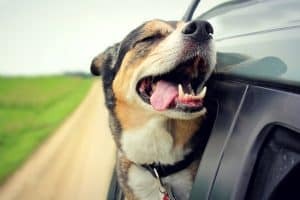 More than half of them (52 per cent) say they have their pooch in the passenger seat simply because it makes them feel happier, while 45 per cent feel more relaxed. One in three (33 per cent) say their dog simply helps them get through their day and a dog can even be a valuable team member with over half (53 per cent) revealing that having their dogs with them has actually assisted in winning new business. Nearly two-thirds (65 per cent) of UK van drivers and operators own at least one dog, with 36 per cent of those having more than one. However, Mr Bridge stressed the importance of suitably restraining dogs, according to the Highway Code, with a seat belt harness for example.